Compact fluorescent (CFL) bulbs have come a long way in the past few years. New versions resemble incandescent bulbs and put out a nice, warm, white light. Despite all their pluses, though, these energy-saving li ght sources have a serious downside: Most, even those labeled “dimmable,” can’t be dimmed very low with standard dimmer switches. Similarly, many LED bulbs, even those labeled “dimmable,” won’t dim much below half brightness with a standard dimmer. But electronics manufacturers have stepped up to the plate with a new generation of dimmers that cater specifically to high-efficacy lighting. One example is Lutron’s new C•L family of dimmers, which are available in four switch styles, including one for table lamps. The reason high-efficacy bulbs are so much harder to dim has to do with differences in how they and incandescents generate light. In an incandescent lamp, a tungsten filament turns white hot at full operating voltage. A standard dimmer switches the power on and off over 100 times a second, effectively reducing the voltage so that the filament doesn’t get as hot and the lamp produces less light. A CFL bulb works in a very different way: A high voltage from an electronic ballast ballast creates an arc inside a spiral glass tube that contains a tiny bit of mercury vapor. The vapor turns into plasma that emits UV-light, which is converted to white light by a phosphor coating on the inside of the tube. If you try to dim a standard CFL by lowering the voltage, it’ll work normally to a point, then just shut down because there’s not enough energy to sustain the plasma. “Dimmable” CFLs have ballasts designed to handle the rapidly pulsing voltage, but they don’t dim to low light levels, either, when paired with standard dimmers. Lutron’s C•L dimmers allow you to finetune the low end of the dimming range, enabling a low light output from a dimmable CFL or LED bulb. This is done by adjusting a little wheel on the dimmer, which essentially establishes the lowest possible threshold to which you can dim the CFL before it goes out or flickers. You can’t dim a CFL or LED to zero light output as you can an incandescent, but the difference in the light level that the C•L dimmer produces is pronounced. The new Lutron dimmer can be used with both dimmable CFLs and dimmable LED bulbs as well as incandescent or halogen bulbs. I tried it with a 23w dimmable CFL (equivalent to 100w incandescent) and a 7w dimmable LED (equivalent to 40w incandescent). They both dimmed to a low level I’d estimate over 90% with the Lutron dimmer. That’s a big difference compared to a standard dimmer. When set to the dimmest setting, both switched on fast (though not instantly). When dimmed too much, the CFL flickered something that will kill the lamp fairly quickly, and why you need to adjust it. There are a couple of things to keep in mind with this new dimmer. First, the color of the light doesn’t change as it’s dimmed. We’re used to a really warm light from incandescent lamps that are dimmed way down, and you don’t get that shift in color temperature with CFL or LED bulbs. Second, if you replace the CFL or LED bulb (especially with a different wattage or manufacturer’s bulb), you should readjust the low-end dimming setting. It’s not difficult; you just take off the wall plate and adjust the little wheel until the bulb is as dim as it can be without flickering. The light will turn back on after being turned off. 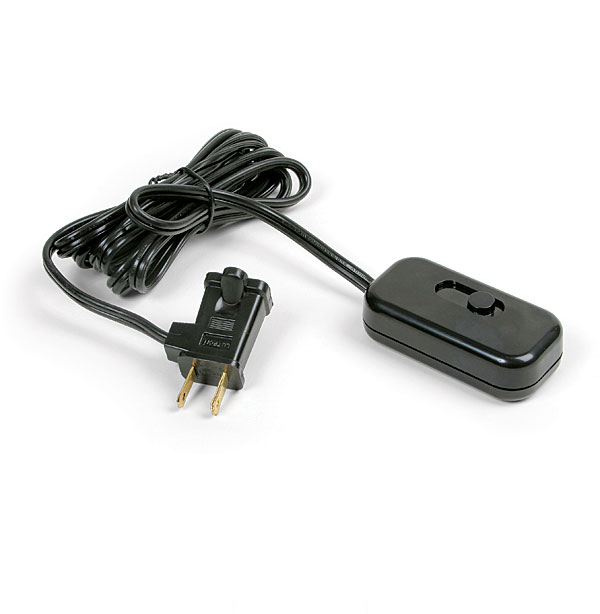 This dimmer doesn’t need a neutral wire connection like some dimmers, which is an advantage in the common situation where there isn’t a neutral in the switch box. As with any dimmer, it’s important to make sure the dimmer wattage rating is equal to or higher than the total wattage of the lights it’s controlling. 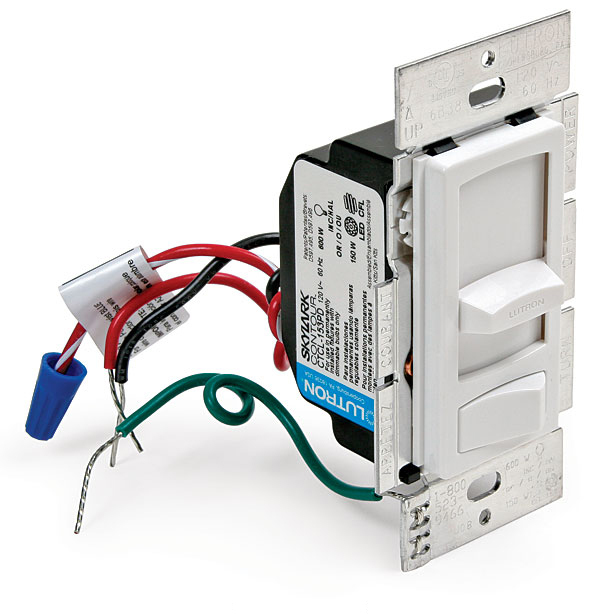 Because the dimmer is bulky, be prepared for a tight squeeze if you’re retrofitting one into a small switch box.